A better way to wash and dry your dishes. This combo pack is the ultimate dish washing bundle. Get one of our advanced Super Scrubbing Cloths, one Waffle Weave Cloth, an Ultimate Kitchen Cloth and a Microfiber Washcloth. These are four of our most popular cloths at an amazing price. Our scrubbing cloth and ultimate kitchen cloth are unmatched in their ability to scour and deep clean to remove caked on grime. Easily wash even the most dirty pots and pans, yet be asured you will never scratch or harm the surface. Use the waffle weave cloth or washcloth to dry your dishes to a spot free shine. These cloths are specially designed for increased absorbency, and will dry dishes in less time than cotton rags. They are also quite good for washing too! The unique design of microfiber allows it to polish as it dries, so your glasses and other fine dishes will be cleaner than ever. Take the stress out of hand washing dishes with these reusable cloths. They are machine washable hundreds of times so they will last for years. Get Yours Today! Includes the four cloths most used in the kitchen for washing dishes. Take care of all those tough cleaning jobs without using chemicals. Clean Your Kitchen Fast and Easy with microfiber. Microfiber is an advanced material that is woven into cloths consisting of over 90,000 fibers per square inch. This makes it great for cleaning, dusting, polishing, drying and more. Our microfiber cloths are superior to cotton in absorbency and cleaning power. They are also superior to most other microfiber on the market. We only carry high quality cloths that have been proven to work grerat and last for a long time. With just water alone, these cloths will remove 99% of all dirt, grime, dust, germs and bacteria from any surface you use them on. You can use your favorite cleanser, but microfiber works so well, you don't have to. 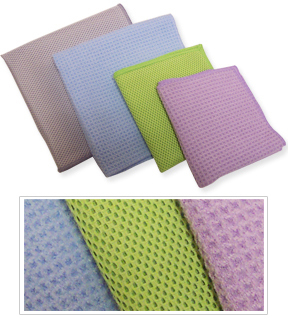 This combination pack includes four of our most popular microfiber cloths. The Super Scrubbing Cloth, the Ultimate Kitchen Cloth, the Microfiber Washcloth, and the Waffle Weave Cleaning Cloth. Use the mesh cloths to wash dishes quickly. With their superior scouring power and high absorbency, they are far better than sponges, scrubby pads or cotton rags. The microfiber does the scrubbing, so you don't have to. Our waffle weave cloths features an advanced design for superior absorbency. Use it to dry dishes and countertops, clean stovetops, wipe inside the fridge and more. Dry dishes fast, and leave them spot-free and sparkling. Dimensions (l x w) 16" x 16" 12" x 12" 12" x 12" 16" x 16"
Dish Washing Combo Cloth Pack - These microfiber cloths are unmatched for cleaning power. Dish washing has never been this easy. Wash dishes, dry spills, clean counters and more. Save money when you buy this convenient 4-pack. Order Yours Today! How do you wash these cloths for re-use? Machine wash with normal detergent and tumble dry. Just make sure to avoid bleach and fabric softener because they will affect performance over time.